As you probably know, Steem HardFork 20 was released 2 days ago and didn't go quite as smoothly as we had hoped. Steemit Inc. has now put out several updates to correct the issues we're facing. The most noticeable issue users experienced dealt with Resource Credits and the inability to post, comment, or upvote with their accounts. This was due to a bug where everybody's RCs were pushed back to a negative value, instead of starting at zero. A quick fix was pushed out via 0.20.3 to correct this which I installed on my witness immediately. NOTE: I've been glued to our witness forums and other channels so I'm on top of everything that's going on. And my witness has not missed a beat. 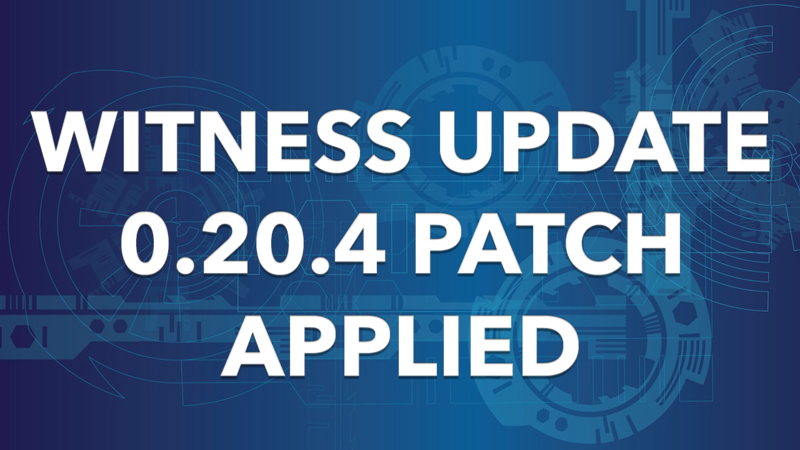 Today, v0.20.4 was released to fix even more bugs that have been found, and to ultimately restore continuity on the blockchain. The most noticeable patch in this version will multiply the resource budgets by 10x. This should guarantee that users will be able to do around 10 times as many operations on the blockchain over the course of 5 days than they are able to now, although this could vary depending on the types of operations. The root cause of the most glaring issues that users are facing is that the initial resource budgeting was far too limiting. Dramatically increasing the resource budgets is the fastest way to remove those limits and return users to the experiences they are accustomed to. There has been some debate as to whether this will truly correct the issue. But we're moving forward with the patch nonetheless. And I've already updated my witness with this newest version. You can read the full release notes on Github to learn about other fixes this patch aims to correct. Most of the issues are pertaining to RCs which are what allows users to transact on the blockchain, and was the highlight of HF20's release. It's unfortunate that the issues we're having involve the end users (and their experience) to this extent. Had it been another aspect of the blockchain, many people would've never even noticed. But because this directly impacts the way users transact on the platform, it's gotten a lot of bad press. I'm glad to see that we're on the right path to correcting these issues. Although it hasn't been pretty, we're getting the job done. And we have to give ourselves credit as the front-runner in this market. We're the leading blockchain when it comes to a freemium social media crypto platform. And the new features we're adding have never been done before. We're trailblazers in a market that we basically created! So yeah... let's give ourselves a little break. At the same time, let's learn from past mistakes. It goes without saying that Steemit Inc. has been bombarded with complaints, frustrations, and negative comments. But they've also received some very constructive criticism which I truly believe they've taken to heart. Witnesses like @reggaemuffin have offered sincere solutions for future blockchain releases and how we move forward with testing new code. And @ned has even appeared in our witness channels which is the first I've seen since I began my journey as a witness. So I'm very optimistic for our future and what this blockchain will bring down the road! I would like to thank all witnesses who spent a lot of their spare time to get the fixes done. this has been painful. but hopefully it all works out. i’m very concerned about ease of use for new steemians. if we want more adoption, regardless of the fancy terms we use now, we have to give them the flexibility to grow and not get too confused. frustrating to watch so many forget about the new steemian in all this. i hope the future gets easier for them and more adoption can happen. It sure has. One thing that still boggles me is why Steemit.com (the UI) hasn't updated their interface in some time. And why didn't they add the RCs to the dashboard somewhere so people know their balance and how they can use them? Perhaps this is coming later, but the whole idea was to sort of gamify the platform and improve the user experience. It's almost as if Steemit.com (the interface) was never meant to be a long-term application, but rather a starting point for other Dapps on the blockchain. I hope that's not correct, because I use Steemit more than any other app here and think it deserves to be updated even (and especially) if it IS simply a model for other apps. that’s a good point. and even before hardfork 20 we had no idea about bandwidth. i remember that video you did months ago when you discovered it. it’s like they assume everyone is a programmer and understand all the backend stuff. which of course scares away every day adopters. I don't even use Steemit anymore. I use busy.org or @steempeak. They both have much better UI and provide more stats and notifications. 😆 LOL, I can't believe in 35 years this is the first I've heard this. Happy weekend to ya brother! Hope it's a good one. It has been a week of ups and downs but as we all grow we learn many things along the way. This we prove to be a learning not only for the small fish but also the witnesses which will see some changes in rank due to this issue as more voters want them to become more involve and accountable. The fact is that we need to no longer allow Steemit Inc to be the sole developer of the blockchain as there are many talented projects and groups capable of also bringing code to the table for the future of the ecosystem. The path to Hivemind and SMTs will surely be interesting. thanks very much for your efforts and updates brandon!!!! I have added you as witness. Thanks @brandonfrye. I appreciate the work and time invested in keeping your witness running. Well that was an exciting few days for everyone on steemit and really the lessons should have been learned way before they implemented HF20? No one in their right mind would release such a buggy update....wait! Microsoft, Google, Youtube and any other large tech firm you can care to think of release total crap at every update and then expect ordinary everyday users to find and report the bugs. I am on the pre-release group for Microsoft Windows 10 and it is always a crap shoot if it is going to work. Drivers are dumped and replaced without warnings and we find ourselves having to roll back to older drivers etc. The ordinary everyday user is basically screwed until the fixes are made or someone puts out a work around that an idiot can follow. This is unfortunately the tech business model and to be totally honest. The steem devs were pretty fast with the patches and the witnessses 'mostly' redeployed as fast as was technically possible to do it. All those complaints I assume came from people with little or no experience in the the computer industry where it is the norm to release buggy code. No other industry is like this but it is what it is. Imagine buying a car and then they tell you when you are driving down the road that they will send the brakes as soon as they are ready. This is life on the bleeding edge and we (steem) are certainly out there. You know that you have my support. You are doing a great job.